Pain. Grief. Love. Hope. Broken hearts. Mending hearts. Wide open spaces and pasts that cage in. 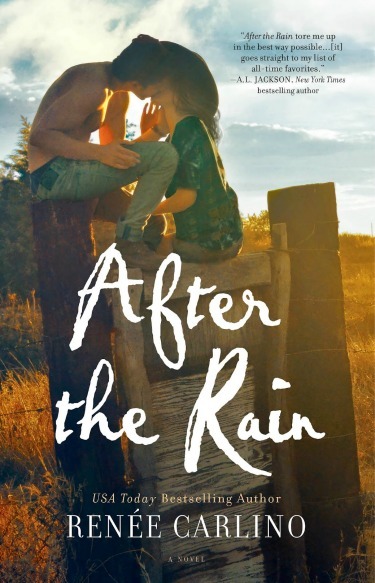 Renee Carlino explores this all in her latest emotionally gripping release, After the Rain. I loved every moment of reading it, from the very first page. Renee’s prowess at compelling storytelling is impressive, once again reminding me of her ability to pull me into her stories, each with their own unique edge, each utterly romantic and each entirely consuming. This is a beautiful story of second chances… about fate, choices and events that happen beyond our control. Avelina (Ava) Belo had a bright future in front of her, especially after meeting and falling for a confident, good-looking cowboy like Jake McCrea. Just three months after meeting, they tied the knot and moved to Montana to work together at a cattle ranch. Life was good, full of love and possibility… until an accident shatters their future into a million pieces. Ava goes from newlywed to widow and shuts down. For the next five years. In alternating point-of-view chapters, we meet Nate Myers. A man who strives to be the best cardiothorasic surgeon there is… better than the best, in fact, since the best out there is his own father. He’s thrown himself into medicine, learned the discipline since he was a child, so when he graduates at the top of his class, his future is defined by his drive to succeed. In fact, he’s had time for nothing else. For him, life is defined by the edge of a scalpel. But one day and in a split second, he loses a patient and is consumed by guilt. Alone and despondent, his future turns nebulous and he begins to question everything. So Nate’s father sends him to his Uncle Dale on a Montana ranch. The same ranch where Ava continues to exist as a shell, lost in her grief, in her anger, in her solitude. Nate is mesmerized by her. By this beautiful young girl who is paralyzed by her past. Slowly, moment by moment, Nate helps Ava find laughter, brief moments of respite from her own darkness. Before too long, Nate finds himself caring for her. She’s been the first person he’s cared for and desired in a way that holds his attention. His eyes are suddenly open to living. The story takes many a turn as we see two people trying to find hope and love in each other’s arms. It’s not easy though, especially for Ava, whose heart is beyond broken. It’s mangled and in pieces and afraid of loving and losing all over again. Ava’s character is fascinating and intriguing. At such a young age she harbors so many complex, dueling emotions. She’s sad. She’s guilt-ridden. She’s angry. She’s scared. She’s given life and love her all, and not only has she lost those she’s loved, but she’s also lost her sense of self. Who she is. Who she wants to be. Nate must also work through figuring out what his life is all about. It’s not all about that operating table, it’s about the life he leads when he’s away from the hospital… about the man he wants to be. Could Ava factor into his focused, driven life? If you love a well-written emotional book full of romance and heartache, look no further than this novel. It was so well crafted, so gripping, I really couldn’t put it down. Renee has become an autobuy author for me and I cannot wait to see more from her. I loved this book, and I’m betting you guys will too. Don’t miss this one. love your reviews Vilma! I love Renee and cannot wait to read this!